This post is dedicated to my mother, Grace Ketroser, who died in October, 1985, from lung cancer, and who understood the value of community better than anyone I know. Between extensive volunteering and inviting every person in Minneapolis over for a home cooked meal, she was an advocate for being an active and giving member of the community. I still miss her every day. 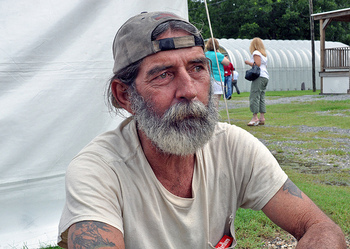 Strong and engaged communities are hallmarks of successful nonprofit organizations. Whether it is fundraising, promoting events, or recruiting volunteers, a vibrant community makes everything about a nonprofit more effective. But the techniques for building these strong communities eludes many organizations. What do those successful organizations know that could be shared so that more nonprofits could benefit? My friend Jennifer Stauss Windrum just finished a wildly successful campaign for SMAC! (Sock Monkeys Against Cancer) on the crowd funding platform, Start Some Good. The entire back story of how this project came to be (here, here, and here) is pretty heartwarming. The way that Jennifer went about creating and building this community was truly masterful. And although SMAC! and WTF (Where’s the Funding) Lung Cancer, the parent initiative that spawned the SMAC! campaign, are social good ventures, not nonprofits, the same principles apply. I met Jennifer through a Facebook group called Punk Views on Social Media (PVSM.) Jennifer first decided to create SMAC! in the spring/summer of 2011. Her crowd funding campaign was not until November of 2012, but she began planning more than a year in advance. Community building takes time. Jennifer enlisted support by asking questions and soliciting help in the very early stages. She created a private Facebook group, and utilized the collective intellect of the members of that group as well as that of PVSM. Jennifer really listened to what we had to say, incorporating much of our input into the choices she made. By crowd sourcing the development of SMAC!, Jennifer was able to build, in her own words, a “group of ambassadors on Facebook.” Jennifer said, “As a one-man band…I couldn’t possibly tackle all that I wanted to. I needed to build an army.” Jennifer had created a comprehensive PR/Marketing/Social Media strategy. This army helped her implement that strategy beyond what would be possible for just one person. Our involvement in the early stages of development created an emotional investment. We were enthusiastic about helping to bring SMAC! monkeys to life. When Jennifer was ready to consider funding sources for SMAC!, she decided to rely on this community she had created by embarking on a crowd funding campaign. One of the key components of the SMAC! campaign’s success was Jennifer’s extraordinary ability to tell her mother’s story, particularly through video and blog posts. She openly shared the raw emotion of what it was like for her mother to be fighting lung cancer. We fell in love with her mother’s spirit and courage and felt as though we were building a living legacy to this woman who was losing her battle with lung cancer. This authenticity and transparency was a part of everything Jennifer did. She built our trust because she was very clear on the motivation for this campaign, and on what would happen once the money was raised. This inspired us to become (and remain) involved in the community. Jennifer also realized that she needed to provide multiple strategies for engagement so that everyone could find a way to help promote the message. She provided a clear plan with steps we could take to support SMAC! This meant that not all of her efforts were on just one platform or even online. She utilized Twitter and Facebook to reach people. But she also sent out email campaigns, text messages, and did extensive blogger and media outreach. For those not online, she created SMAC-downs, events to promote the cause, and provided instructions to people across the country about how to host their own SMAC-downs. And she live-streamed happenings as well. Her outreach was incredibly comprehensive. This campaign was not easy for Jennifer. There was a fair amount of stress built into the process already. She was creating something that was, in many ways, completely foreign to her. Just before the campaign was set to launch, her mother decided to discontinue all but palliative care. No one was sure how long she might have. But with aggressive stage IV lung cancer, her time was certainly limited. There were so many other hurdles and difficult situations along the way. But what impressed so many of us, was Jennifer’s tenacity, even in the face of extraordinary adversity. Regardless of what else was going on, she just kept going. The most extraordinary part of what made the SMAC! campaign successful was Jennifer’s ability to show gratitude to everyone involved in the process. She thanked people online with Facebook posts and with video. She thanked people personally via email and Facebook messages. She continuously told us that it was our hard work that led to the success of the campaign and never seemed to take credit for her hard work. That great humility made Jennifer irresistible. We couldn’t wait to help her every step of the way because we had fallen in love with her. I am so grateful to be a part of this truly awesome SMAC! community. Jennifer created an environment in which her journey became our journey and her victory became our victory. And we all felt as though we had been a part of something magical. Imagine if more of our nonprofit organizations became skilled at building communities the way Jennifer built this one. I can only imagine what might be possible if more of those organizations created some of that magic for their communities as well. I learned, as I was writing this blog post, that Jennifer’s mother, Leslie Lehrman, had lost her battle with lung cancer. May Jennifer find peace and comfort in the living legacy that has been created in this extraordinary woman’s memory. Homecoming King and Queen. It seemed so important at the time, but we discover as adults that what leads to winning a popularity contest as a teenager is pretty superficial and doesn’t tell us what is truly important and meaningful about people. Klout, self described as, “the standard measure of online influence,” is in that same category. Having a high Klout score has about as much value and meaning as being voted onto the homecoming court. Sure, it’s great for your ego if you have a high score. However, does it really mean you are influential online, and if so, what is that influence really worth? A few weeks ago, I attended Social Media for Nonprofits in Chicago. One of the speakers, Justin Ware, spoke about the value of finding influential online ambassadors for nonprofit causes. He referred to Klout as a valuable tool, imperfect, but a good starting place. As soon as he said that, my stomach lurched and I felt a strong desire to scream, “STOP! Don’t you know these are nonprofit professionals? They don’t have time to waste. They are here looking for help with social media.You are throwing smoke and mirrors at them.” When Justin asked for questions and comments, I expressed some of my thoughts about Klout. After Justin’s presentation, he and I continued the conversation and decided to do “dueling blog posts” about Klout. Justin’s post is here. I have so many concerns about promoting the use of Klout to any audience, but particularly a group of nonprofit professionals. Essentially, Klout utilizes activity level on social media platforms as an indicator of actual influence. But activity is not influence, which is much more complicated and nuanced. Additionally, Twitter is Klout’s starting point, but users can grant Klout access to their profiles on other social platforms. However, those who do not allow access to multiple platforms are not differentiated from those who do. A person may be highly influential on Facebook but not allow Klout access to her profile, and is therefore penalized with a lower Klout score. Furthermore, a person with a high Klout score may be engaging heavily with a particular audience that has no relevance to a nonprofit. Since Klout doesn’t give any indication of who they believe a person is influential with other than a short list of fellow tweeters, it is difficult to determine who this audience might be. A person may be very active in the business community on Twitter. But if a nonprofit is looking to impact low income youth in the city, there is a disconnect. Another problem is that topic expertise on Klout is so incredibly easy to impact by users. During Justin’s presentation, I mentioned in a Facebook group that I was frustrated by his portrayal of Klout as a worthwhile tool. Before he finished, Hunger Games had been moved into his top three topics of influence. Not by people who had ever met him, or by people who had any particular expertise about Hunger Games. But by four fellow members of the group who happened to have fairly high Klout scores. It is this blind trust of high scores that is so problematic. Justin suggests that there aren’t hordes of people gaming the system. However, the ability of users to determine where expertise lies when they may have no experience on a topic detracts from its reliability. This blind trust of high Klout scores has made its way into employment hiring. As revealed in a piece on TechCrunch, Salesforce recently posted an open position in which one of the requirements was a Klout score of 35 or above. Even for an established company such as Salesforce, it is just too tempting to look at someone’s Klout score and not do the additional research that Justin recommends. And in the nonprofit world, where there is always a struggle to keep up in the world of technology, Klout may be seen as a valuable shortcut. Unfortunately, by using this shortcut, people with great skill and expertise, but less time to focus on their personal social media profile, will be passed by. Measuring online influence is an incredibly complicated task. I’m not sure if we will ever come up with a great tool to help us determine that influence. But I am convinced that Klout is not the right place to start a search for online ambassadors for a cause, for a business, or for anything else. What are your thoughts? Do you agree with me or do you think Justin is right that Klout is a good starting point? What have been your experiences with Klout? Please add your thoughts to the comments below. You know all those spam tweets about winning an ipad? Well, I really did win one. Seriously. I created my Twitter profile in 2009 because I kept hearing how great it was. It took me a few months to understand its power and value. However, in the past three years, I have had a wealth of experiences come my way because of the relationships I have built on Twitter. I have a long list of opportunities that have arisen from my involvement in social media. I was quoted in the New York Times as well as Crain’s Chicago Business, and the journalists who wrote those articles found me, in some way, through my connections on social media. I have traveled to conferences and stayed at homes of people I knew through social media. I have presented at too many conferences to remember them all because of my social media connections. I have certainly found clients and I have worked on some truly extraordinary initiatives that came my way through my Twitter and LinkedIn connections. But the highlight of my experiences in social media was something that happened over one year ago and still makes me grin from ear to ear. On December 25th, 2010, I turned 50. I had plans with some friends to make and deliver bag lunches to homeless people who would be out in the city on a cold winter Christmas afternoon. It seemed like a way to celebrate a milestone birthday at a time when I felt profound gratitude for my life circumstances. We gathered to put the lunches together. I thought we were getting ready to go deliver the food, but instead I was handed a gift bag. I truly did not expect a present and couldn’t imagine what my friends would have bought me. I took the gift out of the bag and ripped off the wrapping paper. 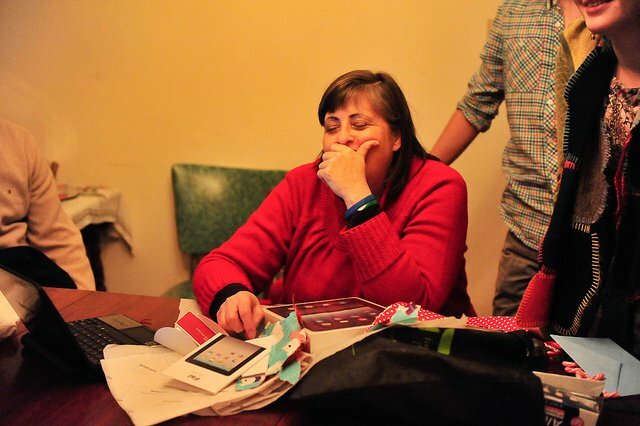 To this day, I still haven’t really recovered from the overwhelming flood of emotions as I saw that ipad. About 25 people who I had met on Twitter had created a secret Facebook group and conspired to buy me this extraordinary gift. They said they appreciated all that I had done for them and for the Chicago community and wanted to show their appreciation. At that time, I didn’t have a smartphone and was lugging my laptop everywhere. 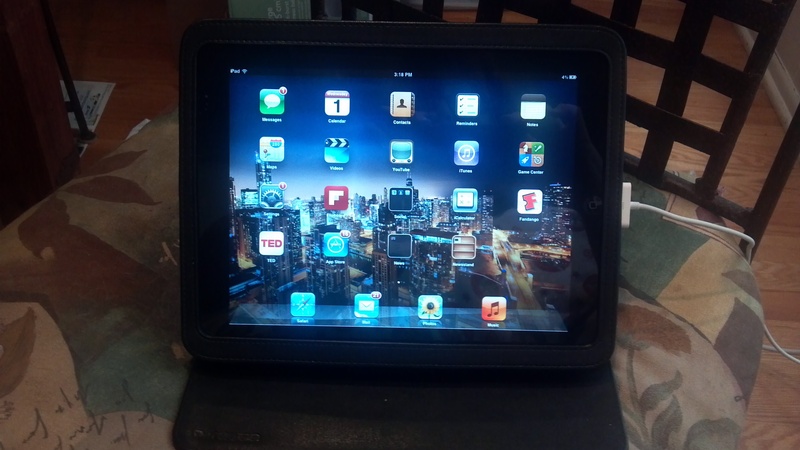 They decided an ipad would allow me to travel much lighter as I walked to my many meetings and events each day. I was so moved by their generosity and giving spirit. I have created an annual conference for nonprofit organizations on technology and utilized my Twitter network to find the majority of the speakers. I have helped organize nationwide fundraisers for incredible organizations utilizing social media. I have been able to drive fairly significant traffic to my blog through my social media connections. And I continue to find wonderful events to attend through my online network. But I can’t imagine that anything will ever surpass what I experienced when I received that ipad. Because, as great as social media is, it is ultimately just a tool that facilitates introductions to and conversations with people. The real impact begins by nurturing those relationships beyond just 140 character tweets. That’s when there is real power and value that can be attributed to social media. I am fed up with all of the e-newsletters coming to my inbox. This frustration stems from the fact that I didn’t sign up for these newsletters. I posted on Facebook that I was on an unsubscribe mission. Based on the many comments posted in response, it seems as though there are a whole lot of folks who agree. So I decided I needed to do a follow up post to I Can’t Find You: How to Self-Promote Without Being a Douche. I am a firm believer in self-promotion. I wrote that post because I don’t think some people promote themselves enough. But it has to be done right. And for some reason, what is right isn’t always very clear to everyone. So, here is my list of things you shouldn’t do when you self-promote. 1. DO NOT ADD PEOPLE TO YOUR E-NEWSLETTER WITHOUT THEIR PERMISSION. Were all those capital letters annoying? Certainly. But not nearly as annoying as all those newsletters I am getting. I got one last week from an African American Evangelical Christian group. I am a white Jewish girl in the suburbs. WTF folks??? Look, I send an e-newsletter. And building the list that receives it has been painfully slow. I think I have under 100 on the list. But everyone on that list is there because they chose to be. And just because I agreed to be your LinkedIn connection or your Facebook friend does NOT mean I agreed to let you sign me up for your newsletter. Capeesh? 2. And speaking of LinkedIn, sending me spam via LinkedIn is a major nuisance. I know you are sending these messages to all of your contacts, so it is just guilt by association. But don’t do it. If you really want me to attend your event, send me an individual, personalized email. That way I know you actually thought about it first. If you keep sending these to me, know that I shall be un-linking with you. Life’s too busy. I don’t need 12 different notifications of your events. And for some of you, I don’t really want any. I don’t want to attend your events. My lack of attendance and lack of response should be an indication that this is the case. Stop spamming me. 3. And still speaking of LinkedIn, do you really think I am going to approve a request to connect from someone I don’t know and have never heard of, with the LinkedIn template? “I’d like to add you to my professional network” is lame. Expediency is sometimes highly overrated. If I don’t know you, why would I approve that? You have to convince me. So take a few moments to craft an effective ask that explains why it is in my interest to connect with you. It won’t take long, and the payoff is that you get what you want. 4. Unless you and I are close friends, do NOT ask me to vote for you, share your blog post, or leave a comment. I could spend my day just responding to these requests. And none of these folks are going to pay my rent or any of my bills. And usually they aren’t going to promote anything I do either. 5. When you choose your title, choose wisely and carefully. You are not a ninja, guru, jedi, or expert just because you say so. Leave that to other people to say when they describe you. Otherwise, you sound like a douche. Truly. 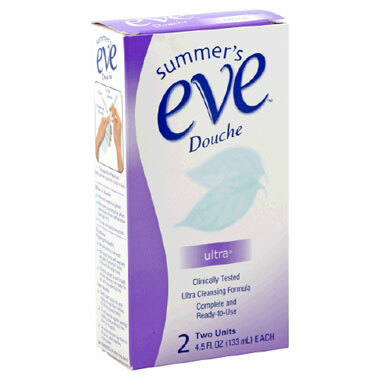 I know I am leaving out boatloads of annoying behaviors. Please add your pet peeves in the comments. I’m Not a Fundraiser. Really! I am not a fundraiser. In reality though, working in the nonprofit sector means everyone is involved in fundraising. So it’s not that I have never worn the fundraising hat. It just isn’t the primary description I inscribe on my shingle. However, social media and the people I have met through those channels seem to be slowly changing that for me. It all started a few years ago when I met my friend Geoff Livingston on Twitter. Not long after we exchanged tweets, he traveled to the Gulf with Citizen Effect. Geoff is a talented photographer who used his camera to document the impact of the BP oil spill on the people of the Gulf. His compelling photographs captivated me every day. After the trip, Geoff and the rest of the Citizen Effect group that traveled together decided to create a national fundraising event with coordinators in each city to benefit Gulf fishermen and their families. I was soon recruited via Twitter to be the Chicago coordinator. It was no easy task to coordinate this national event via the telephone, twitter, and email. But Citizen Effect did just that. We spoke regularly to coordinate, brainstorm, and share ideas. Most of the promotion we did was via Twitter, Facebook, and blog posts. That is how the buzz was created for the trip to the Gulf and how the buzz was created for the national fundraising event. Ultimately, I think what made the entire initiative work was the photos that people shared. Whether it was Geoff’s pictures from the trip itself, or the photos from the night’s events, the pictures made it real. And now I am in the midst of getting to work with Geoff once again on a national fundraiser. This time it is with Razoo. On June 14th, cities across the country will join together for a day called Twive and Receive. Each city has a coordinator who chooses a nonprofit to be the day’s beneficiary. I have chosen Open Books to be the recipient nonprofit organization. During these weeks leading up to the event, we are using blog posts, Twitter, Facebook, and the website that Razoo has created for us to promote Twive and Receive. Chicago has a pretty large network of people who are involved in and passionate about social good. One of the challenges for us will be that many people already have their pet causes. I have begun reaching out to high impact individuals who are not already tied to another organization. Their support and outreach via social media, blogs, and announcements at events in Chicago will be critical to our success. Additionally, we will use the network that Open Books has created to promote Twive and Receive to their network. I will also be utilizing my own network on Twitter and Facebook to promote this event. I encourage you to consider serving as a coordinator for your city. Working with Citizen Effect and now with Twive and Receive, connected me with a whole new community of do-gooders and I learned so many great skills about effective promotion, event creation, and utilizing social media in the nonprofit sector. To this day, I still feel pretty great about the money we raised for Gulf fishermen and their families. And I am thrilled to be able to help do the same for Open Books. If you are uncomfortable with the idea of promoting yourself, think of it as providing a service to others. Frequently, I need to find people’s websites, blogs, or other online information. It is so easy if they include that information in their email. If they don’t, I have to search for it, which can take several minutes. Here is a short list of easy things I believe we all should be doing to become more searchable and to promote ourselves-not in a spammy way, but in a professional, appropriate, and helpful way. 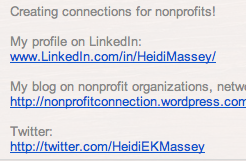 As you can see above, I include a tagline and links to my LinkedIn profile, this blog, and my Twitter account. Once I have a website up, I will link to that, which will include my blog. You can certainly include a phone number, an email address, Facebook page, or any of your other online accounts. I always thought including email was redundant. But it isn’t incorrect to do so. When you read blogs, do you leave comments at the end? I make it a point to comment on blogs for a number of reasons. It is a way to acknowledge that you appreciate the effort someone took to write that post. We all can look at statistics to see that people are visiting our sites, but it is the comments that really provide the proof that folks are reading and thinking about what they read–that we actually had an impact with our writing. Great conversations can result from commenting. It gets me thinking and understanding the issues more thoroughly or from a different perspective. Commenting on blogs increases my “search-ability” on Google. Yes, really. Comments show up and move you higher up in search. A Twitter profile without a bio or a link to a site means I generally don’t follow them back. That bio and site link give me back ground information so I know a bit more about who he or she is. Plus, why skip an opportunity to promote your website or your blog? LinkedIn is also an incredible way to promote yourself appropriately. Websites, blogposts, volunteer experiences, skills. People are looking at your profile. Why withhold information that may help them hire you or promote your work for you?